Are you thinking about a marketing gift that would be inline with your household products? Well, then this is the right post for you! Today, we will be looking at a special marketing gift, ceramic knives! 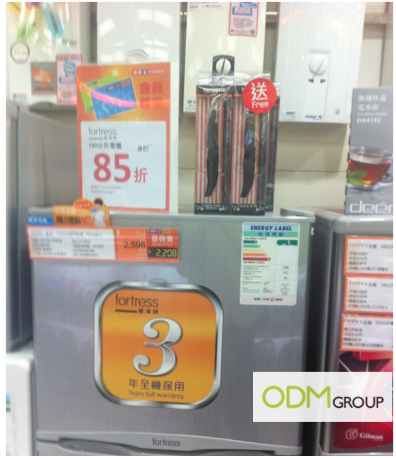 Purchase a fridge and get a pair for free ceramic knives today! Let’s take a step back to understand why this marketing gift works. Most people cook almost everyday, making knives a necessity in the household! As a result, this marketing gift is a perfect gift for the customers! Knives are extremely useful and practical in almost every single household. Especially with festive seasons such as Thanksgiving, Christmas, New Years, coming up, families are purchasing cooking equipment to whip up a good meal for everyone! Hence, knives will definitely be used. As a result, it makes perfect sense for ceramic knives to be your marketing gift. Perhaps the main reason why ceramic knives are extremely user-friendly is because they are exceptionally sharp and there is no need for sharpening! Also, they are extremely easy to clean. More importantly, they are nonreactive to acidic food, like vinegar. Using Ceramic knives to market yourself is unconventional. By having an area to customize your brand and message, you can improve the brand recollection among your customers. You can customize anything that represents your brand visually. Alternatively, you can give this marketing gift during events like food festivals. As knives are used very frequently, especially for customers who cook everyday, it assists in your brand recall. They would be reminded of your brand daily and would be more willing to purchase your brand the next time they shop! Thus, you will see your sales soar. Can’t wait to get this cutting edge marketing gift? Contact ODMgroup today!